Putting sentences together is a good way to practice grammar. We need to use special words to connect the sentences. We need to understand how the subject and verbs relate to each other, and change the sentences so they sound the same. I like books. + History books are interesting. Just add the adjective “history” from the second sentence to the first. I had a birthday. + My friends made a cake. My friends made a cake for my birthday. Make a prepositional phrase with “for” and use the first sentence to explain why the second sentence happened. My leg hurt. I fell off my bike. When I fell off my bike, I cried because I hurt my leg. Use “when” to show the order of events and “because” to show how sentence two caused sentence 1 to happen. 1 Write words in box 1 to describe what the man is doing. 2 Write words in box 2 to describe what the woman is doing. 4 Combine the two sentences into one. 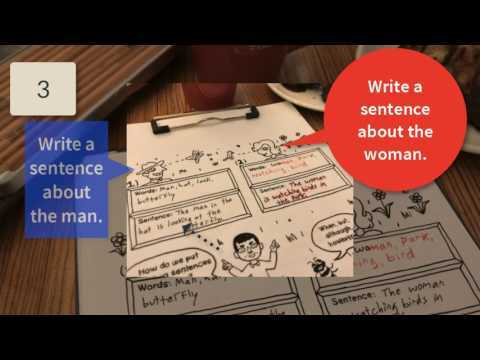 Combining sentences is one of the best ways to improve your English. You start with something simple and make it more complicated. In English that means being able to use extra words and special grammar to let two different ideas work together in one sentence.